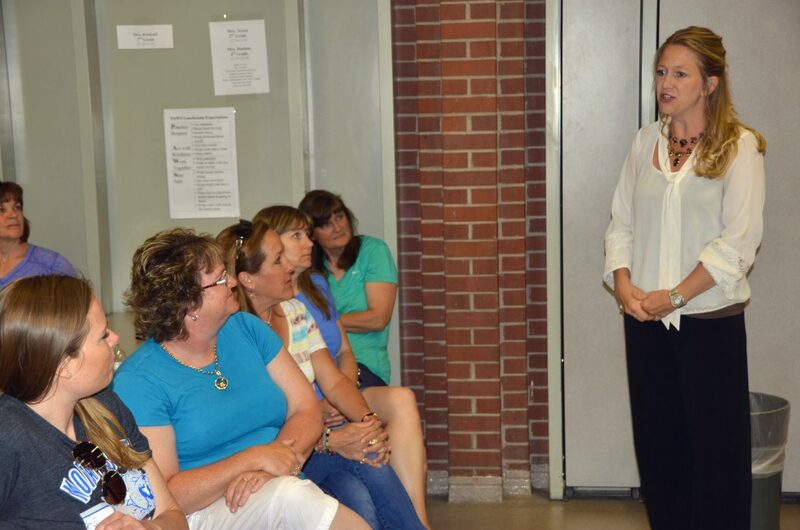 Jill Hafey, right, addresses parents and teachers Tuesday night in the Sunset Elementary School cafeteria. Hafey, currently the assistant principal at Craig Middle School, is one of three candidates who may be hired to fill the principal position at Sunset. On Tuesday night, Sunset Elementary School hosted a meet-and-greet with the three candidates in consideration for the principal position. The three finalists include Allan Ward, Colleen Harrison and Jill Hafey, who will continue to be evaluated throughout the week. Ward, who holds a bachelor’s degree from University of North Texas and a master’s from Adams State University, currently serves multiple functions within North Park School District in Walden, working with students ages preschool through 12th grade in special education and the gifted and talented program, among several other departments. 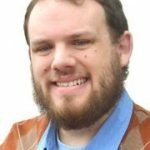 “I’ve been in the classroom to learn as much as I can about different facets of teaching kids,” he said, stating that the time is right for him to make the jump to a principal job. His wife, Amy, is completing her time as the principal for North Park before moving to Craig to fulfill the duties as the new curriculum director for Moffat County School District, which means both of them soon will live in the area even if he isn’t hired at Sunset. Amy Ward’s new role with MCSD was one Harrison originally had applied for, but she thought working with Sunset also would be a good fit for her, having served as principal of King-Murphy Elementary School in Evergreen for several years before moving into a curriculum coordinator role for Clear Creek School District, which she has held for the past two years. Harrison obtained her bachelor’s and master’s degrees from Portland (Oregon) State University, followed by a doctorate from Oregon State University. She mentioned to parents that her experience in conflict resolution is something she thinks will serve her well, should she be hired. “One of the things I’ve seen here is that (Sunset) is a great school, with wonderful teachers and students,” she said. Sunset was the key for the final candidate, who was a student at the school during childhood. “It’s where my passion started with my third-grade teacher,” Hafey said. Hafey, who has a bachelor’s degree from Mesa State College — now Colorado Mesa University — has been a fixture at MCSD schools, teaching for nine years at Ridgeview Elementary as well as working as an ELL coordinator. She has been the assistant principal at Craig Middle School for the past five years. CMS Principal Joe Libby started at the beginning of the 2013-14 school year, as did his wife, Laura Vinger, as the principal at Sunset. MCSD opted not to renew Vinger’s contract for another year at the Board of Education meeting in April, which led to Vinger discussing the possibility of taking legal action against the district. Neither Vinger nor Libby could be reached for comment about the issue. Hafey said she did not think taking the Sunset principal job would damage her relationship with Libby. Incoming Superintendent Brent Curtice said he has not heard anything further from or about Vinger, stating that MCSD and Sunset are “moving forward,” adding the recipient of the principal position will be named within the next week. Curtice was among the many district employees and parents in the Sunset cafeteria for the Tuesday event, which allowed them to get an idea of who might head up their children’s school. “You want a principal that you know wants to be there and cares almost as much as the parents,” she said. After meeting with all three finalists, fifth-grade teacher Misty Jones said she thought any of them would mesh well with Sunset. “I think we need somebody with a positive attitude and a good sense of community,” she said.